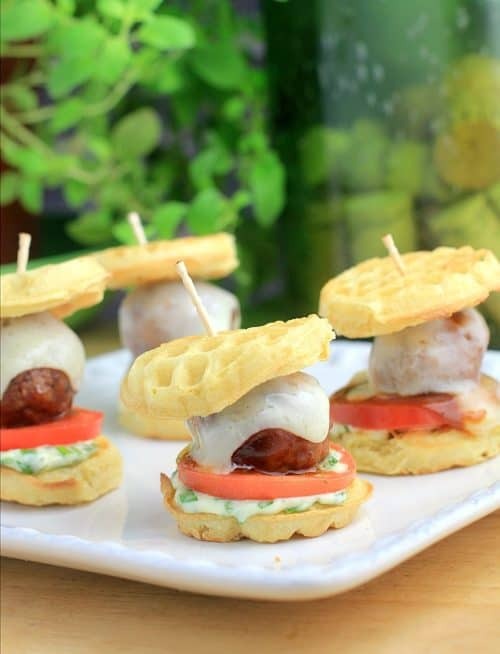 Sweet and saucy barbecue meatballs, sandwiched between little crispy waffles. 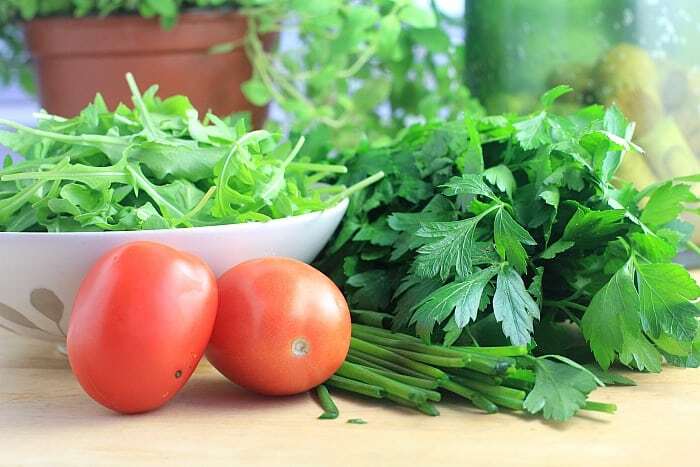 Add in melty cheese, fresh tomato, and a fantastic Arugula aioli for the ages, and you have a party-perfect, DELICIOUSLY mouthwatering bite to share. So, be the rockstar and try this little appetizer. Good news guys! Kellogg’s overhauled the ingredient profiles for their entire line of waffles. Kellogg’s Eggo Mini Waffles and all the others in the whole product line now have colors and flavors only from natural sources. And no artificial flavors. I LOVE when companies listen to us. Especially when I want to make a recipe that requires teensy little waffles that I am not about to make on my own. So, I love waffles. Who doesn’t, right? 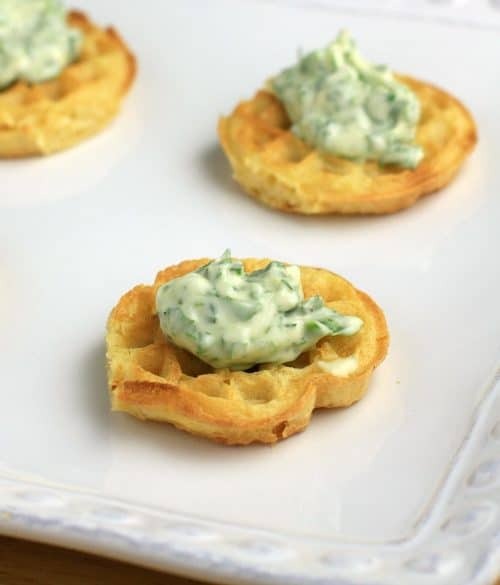 But I especially love to use waffles in savory recipes where you would not expect them. Prime example is my Honey Sriracha Pulled Chicken and Waffles. That is good stuff right there. Really really good. Is it weird that I prefer to use waffles in non-breakfast recipes? I’m talking dinner waffles. 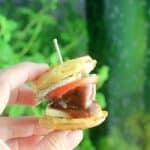 And during the hectic workweek especially, I have been known to pick up some of these frozen waffles as an easy shortcut. …Don’t judge. I also love sliders. Little complete burgers or whatever in one big bite. I love the whole concept of sliders, because you can make a bunch, try different things, then people will try them ALL because each one is not that much food. This discussion is so first world. I get it. Anyway, to work with Kellogg’s Eggo Mini Waffles, I immediately wanted to do a little waffle slider – something I have not done before. I wanted the recipe to be ridiculously easy. Like Eggo Minis are easy – you just stick them in a toaster and BAM! …And I wanted them to be pretty. I wanted them to be easy, but impressive enough that if put out at a party or for an occasion, they would get all scoffed up YUM. 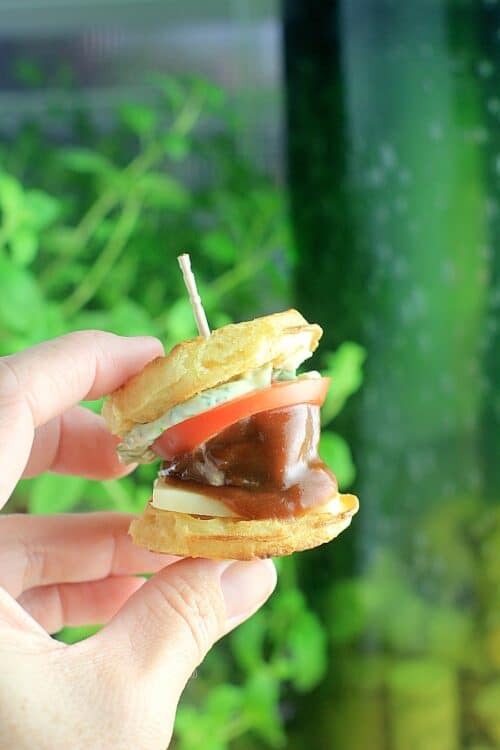 And so, I give you …the Barbecue Meatball Waffle Slider. Which may seem obvious. 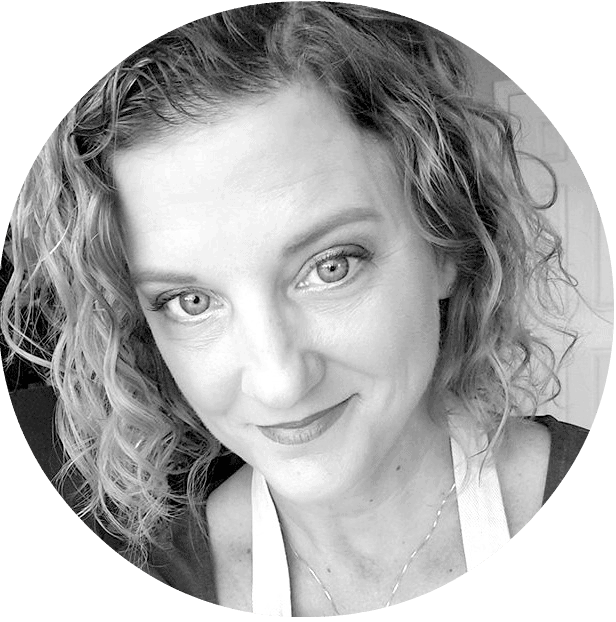 It may seem not that creative on its face, but let’s dive in a little into this recipe, shall we? …because the key is everything else. Arugula, lemon, and fresh herbs in an aioli (which is legitimately my new favorite thing and I’m going to use it everywhere), fresh tomato, melty cheese, and tangy BBQ sauce. The flavors combine for an epic, delicious, phee-nom-enal bite. This appetizer was loved by all, and I do serve a tough crowd so that says a lot. HA! The photo at the top, the first one you saw that got your mouth all watering?? THAT is NOT a meatball! THAT is a vegan beef tip, along with all the other ingredients I used). Fooled yuh. This is what I do a lot now – cook something like this for my family and make a vegetarian version for myself. It is all just too easy. And these little Eggo Mini Waffles delivered too. Because they get so toasty, they held up perfectly – and I do mean literally perfectly. In fact, I was quite pleased how the nice crunch remained even after they had sat out a bit on the platter. Party Perfect. So that’s it folks, and there we are. With such a scrumptious bite. Simple to make and fun, but grown-up and pretty too. I adore this little recipe and I hope you will too. 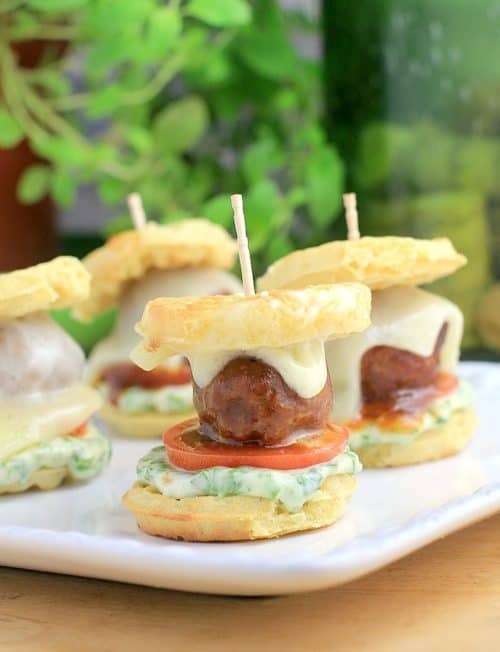 Sweet and saucy barbecue meatballs, sandwiched between little crispy waffles with melty cheese, fresh tomato, and an Arugula aioli for the ages. In a medium saucepan, add the meatballs, barbecue sauce, and mustard. Let it go on low for a while until the meatballs are heated through and it all gets saucy. This can be done in a slow cooker. In a bowl, combine the ingredients for the aioli. Toast the Eggo Minis Waffles until browned and toasty. 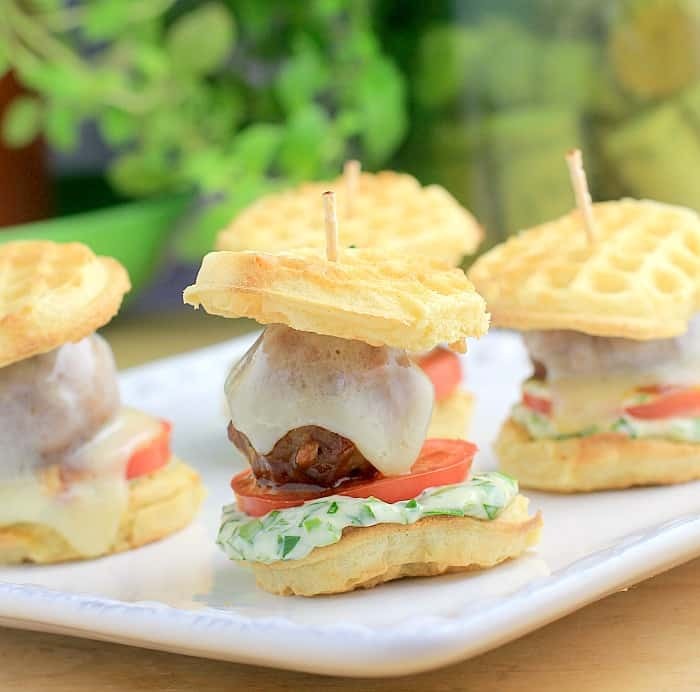 For each slider, layer a waffle, a teaspoon aioli, a meatball, cheese, and another waffle. If you would like your cheese melty, sliders can be popped in the microwave for 10 seconds. Yields: 20 sliders. Leave me a comment! Otherwise, I’m just talking to myself here. Do you do sliders? 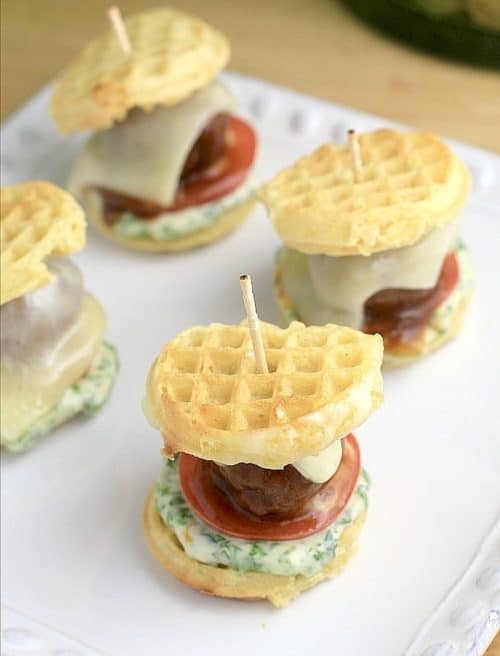 These look amazing and I never would have made a waffle slider!! Now I’m going to have to try these!! Thanks for sharing. They look like yummy party favors! Both sound and look relish! I am a huge meatball fan! these look so good and easy to make. these would make a great cost effective party food! I will def save this for future use. Whoa whoa whoa! These look so strangely delicious, I never would have thought of this yummy looking flavor combination! Pinning for later! What a great little appetizer! I love that you also did a vegetarian version. My parents are vegetarian, and I think they would love these too. Wow so many different ways to eat waffle. This recipe surely does look worth trying. 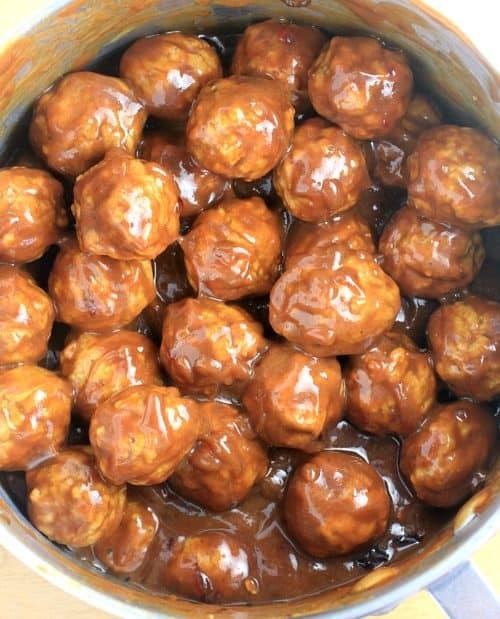 Barbecue meatballs are so yummy. You seem happy about blueberry waffles. I also love when companies pay attention to us lol. Everything looks scrumptious. Good job. The cuteness!!! I can barely handle it! Love the big bold flavors in such a small and snackable bite. Totally saving this one for the next party! I love these! Perfect for a party or potluck! These look incredibly good! This is such a fun, unique idea as an appetizer or combined with soup and salad for a tasty dinner option. Thanks for sharing, I’m really looking forward to trying these! These are adorable. I love meatballs so you know I’ll be enjoying these very soon.